Tempura is a very popular side dish in Japan and they are delicious! Usually made with battered, deep-fried seafood or vegetables, the crispy & flaky shell is a perfect contrast to the soft moist center, and due to the use of a light batter and short frying time, it’s much healthier than most fried food. 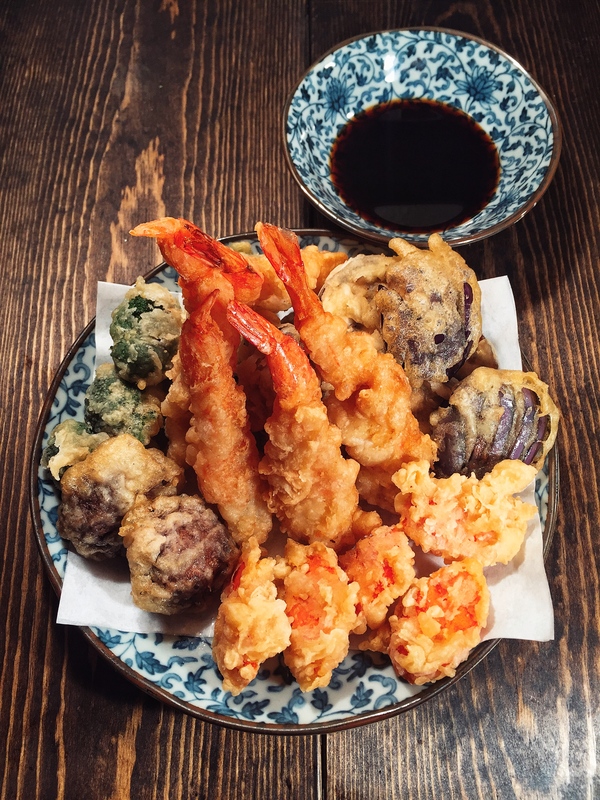 As I said before, you can use both seafood and vegetable for this because they both have short cook time, the Ebi(shrimp) Tempura being the most famous of them all! This dish is simple, quick, and a good recipe if you are a beginner in the fanatically delicious (and not so healthy) world of deep frying. Since this is a side dish, you can have them with some soba or udon or ramen, or roll them up into sushi rolls, you can also just eat them with some rice! The possibility is endless, so let’s make this! Dip shrimp and vegetables into batter and fry, turning occasionally, until golden, which takes about 2 min. If you try to fry shiso leaves (not recommended because it’s very dangerous for beginners), only coat 1 side, then drop, and place it in batter-side-down for about 1 min minute. Transfer to paper towels to drain.